A Crucible of Souls sits squarely in the high fantasy genre, despite not being quite your typical quest novel. Caldan isn’t a farm boy but a monastic hopeful, having been brought up by the monks and trained in swords and sorcery. When he is expelled from this comfortable life, he hasn’t got a driving quest–though he is interested in discovering more about his family’s mysterious heirlooms. Mostly, he’s just looking to put a roof over his head and food on the table. Having had a relatively sheltered upbringing, Caldan is a bit naive and slow to catch onto the way things work in the city. It’s the one flaw in what is otherwise a Gary Stu character. Caldan has a talent for crafting–a form of magic–plays a masterful game of Dominion and is a freakishly talented swordsman. However, “freakish” is the key here; something more is going on that Caldan hasn’t quite figured out, leading to his transformation from someone with a shallow but broad education to a cross-disciplinary master. Exactly what is causing this remains a mystery and provides an extra tension underlying the chaos of other events. Caldan’s preoccupation with surviving and then furthering his education makes him easy to relate to. His naivety also opens the way for Miranda, a young, street-savvy former sailor who is also more than what she appears to be and who takes Caldan under her wing. The relationship between these two is adorably awkward. However, the lack of detail regarding Miranda’s background makes for a relatively shallow character. In fact, I was a bit disappointed with the women as a whole in the novel. While the number of female characters is decent, a disproportionate number of them met with ugly fates. The book’s strengths lay less in its characters than in its magic system. When the story starts, destructive magic is believed to be a myth. While this turns out not to be the case, the creative magic was one of the most interesting aspects for me. Not everyone has magical ability, but those that do are able to channel it into different materials, such as paper, stone and metal. The more durable the material, the longer the magic will last. The magic is given a purpose not only by the nature of the materials it is channelled into but also through the use of runes drawn or etched into the material. I felt this system not only made for some creative uses of magic but also some reasonable limitations. I also found the theory behind magical shielding particularly interesting. 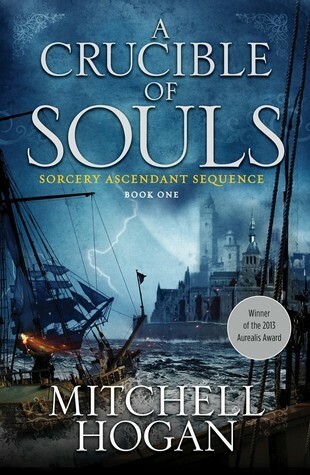 Overall, I found A Crucible of Souls an enjoyable read. While it isn’t exactly groundbreaking, it does give enough of a twist on the genre to make it worthwhile.